Good morning. 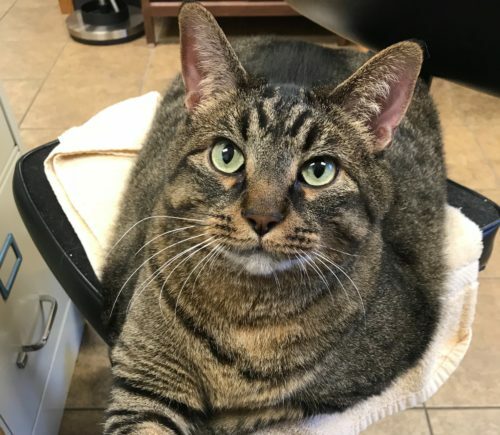 For those of you who don’t know me, my name is Mac, and I’m the office cat at Klein Animal Clinic. My life is pretty good, because I’m around animal lovers all day long. I have my own office and several boxes to sleep in. I could do without all the other animals coming and going, but I’m told it’s good for me to be social with them. My other complaint is that the humans here seem to have gotten it into their professional, qualified heads that I am overweight. I’m a little miffed about it, honestly, but in the spirit of “being my best self,” I’ve taken it upon myself to write about my journey and try to reform my ways. Reforming my ways starts with changing how much I eat. I can’t help it that I’m hungry a couple seconds after I finish my bowl of food. Some cats are just wired that way. But apparently, I need to count my calories. The average cat (I’m above average) needs 20 calories per pound to maintain weight. Since I’m losing weight, I need 2 pounds less, so 40 fewer calories per day = 360 calories per day total. The humans who feed me base how much food to give me on this number, and will adjust it as the pounds start flying off of me. If you stop into Klein, be sure to say hello and compliment me on my physique. While I may look annoyed, on the inside I’m thrilled to get the positive attention.